I’m 36. It’s a good age to be. I have the benefit of nearly two decades of adulthood, with a strong likelihood of at least a handful more decades to continue to experience the world and determine who I will become. I find myself stronger and healthier, physically, emotionally, and psychologically, than I was at 30 or 25 or 20. And more confident and satisfied with life, having been able to productively channel a lifetime of neuroses, insecurities, and anxieties about who I am and who I want to be. That’s some of what I was thinking about right before my physician asked me to turn around, rest my arms on the table, and place my right foot on the step stool. Then, without any fanfare, her well-trained and thankfully slender finger quickly verified that my prostate is, as one would hope, both smooth and petite. And that was that. It had been about 5 years since I’d had a proper physical exam and, with so much training and racing ahead this year, and no longer being a “healthy young man” (I think “young” stops sometime before your first-born child’s 5th birthday), it was time to get checked out. So I got poked and prodded and jiggled, in the name of being a responsible adult. All went well – nothing worrisome inside or outside, despite some minor rips and tears (shoulder, ribs) that I’ll have indefinitely, or until I get annoyed enough to warrant further action. The really uncomfortable part of the process came the next morning, when I went to have my blood drawn. Normally, this is no big deal. 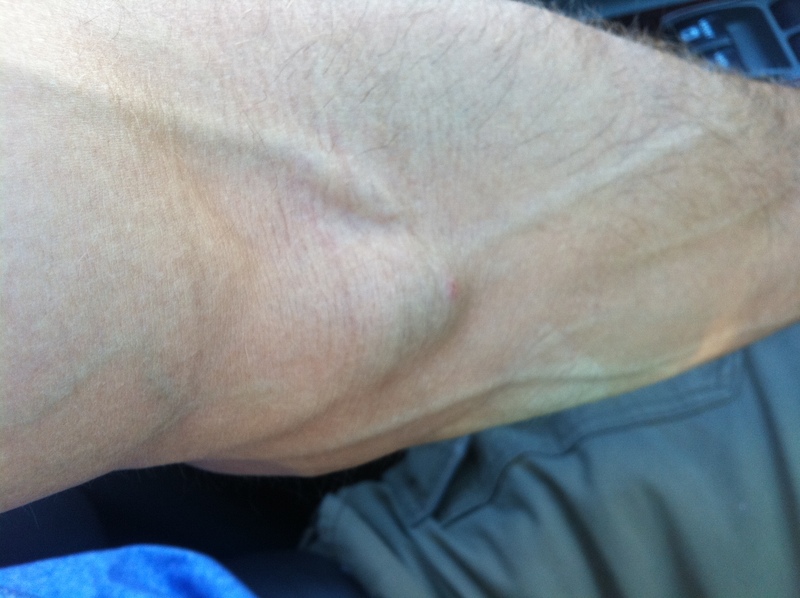 I’m super veiny and not particularly squeamish about needles, blood, or controlled pain. 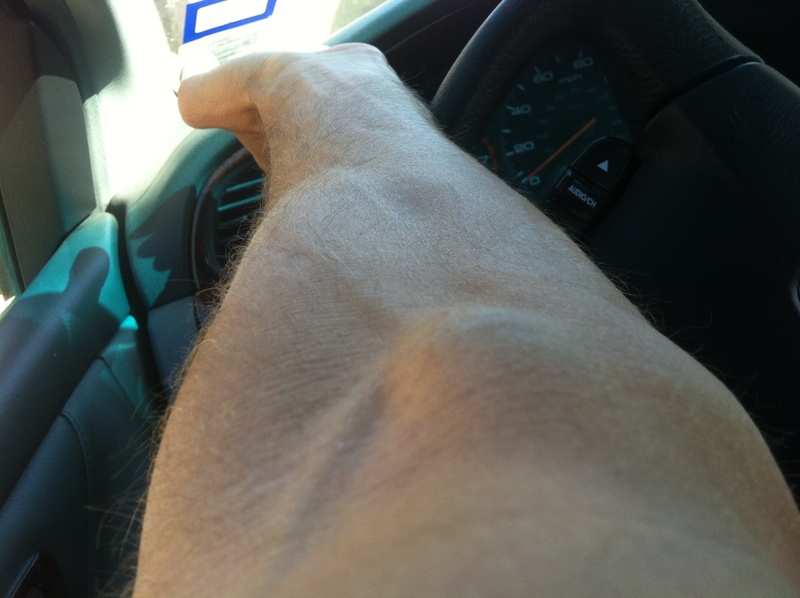 But, for reasons never made clear to me, the kind lady with the needle bypassed a number of eager, engorged veins, instead seemingly looking to challenge herself to extract blood from some deep and unseen magical pool of blood buried in the crook of my arm. The swollen mass of mess was about the dimension of a good-sized super-ball, with a similar rigidity. I found out, just a little later the same day, that neither pull-ups nor swimming do much to reduce swelling or pain. Good news from the lab report is that whatever numbers the doctor wanted to see, she saw. I guess I have good blood. The report was solid enough that I was instructed to “keep doing whatever it is you’re doing” and I can come back in a few years to do this all again. If that schematic of a rectal exam is accurate then my scrotum is in the wrong place.